There aren’t many sports where the professionals are so in touch with their fan base and athletic community — but triathlon is one of them. Professional triathletes can often be seen hanging out before and after races at expos — answering other athletes’ questions and sharing their story. Many also stick around after races to cheer on other athletes! TJ Tollakson about to win IMLP! Part of what makes triathlon so special is this accessibility factor — something to which sports like baseball and football cannot compare. TJ Tollakson is one of these amazing accessible pros – and could be seen after his Ironman Lake Placid win in 2011 talking to other athletes & getting the crowd pumped up (as was the case with Andy Potts… but we’ll save him for the next spotlight :))! He happily spoke to my brother and I after the race, gave us some advice, and took a photo – as well as speaking to many others and showing his support for the IMLP community. meeting TJ Tollakson after the race! 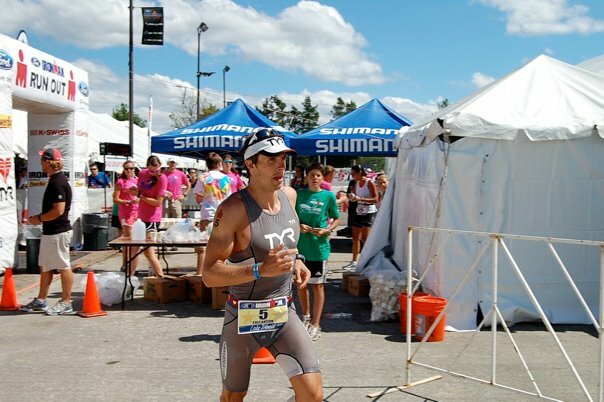 TJ is not only a pro triathlete, but also an industrial engineer, entrepreneur (he owns www.rustersports.com), and father! You can follow his training journey & life through his twitter and website. Who is your favorite professional triathlete? Has the accessibility factor of the sport enabled you to meet them?